The Mairie de Montreuil - Ibis Styles car park is ideally located in the heart of the city ​​of Montreuil . 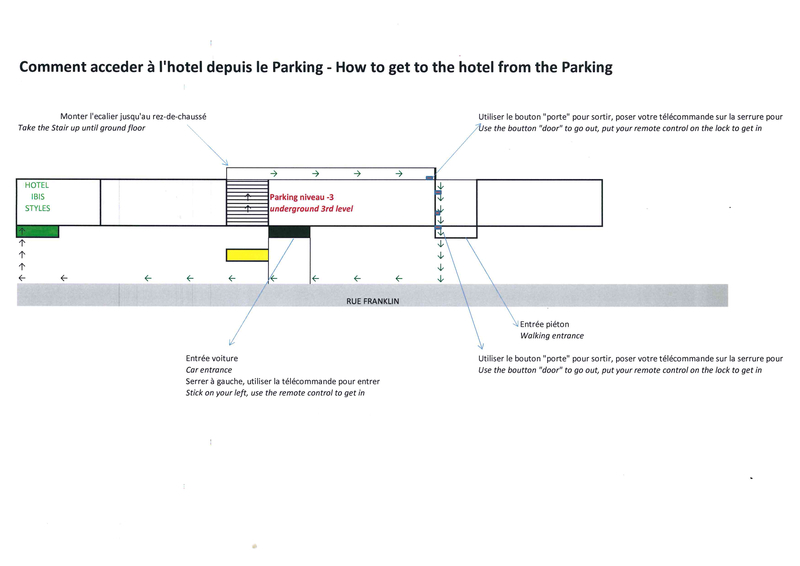 This car park is provided by our partner Ibis Styles Paris Mairie de Montreuil . Go to the hotel reception with your Onepark confirmation email (on your mobile device or printed) to get a remote control. To open the parking door, press the button on the remote control. Onepark slots are at level -3 and are painted green. Thank you to return to the hotel reception to deposit the badge once your vehicle is parked. A pedestrian exit door is at the end of level -3 and allows you to come out on the street. To access the car park, after having recovered the remote control, please re-use the same pedestrian access by presenting the remote control on the sensor provided for this purpose and situated to the left of the pedestrian gate. To get out of the car park, make sure to position yourself on the yellow rectangle painted on the ground, located at the bottom of the exit ramp. Once out of the car park, do not forget to re-install the remote control. You can download the map of the car park below.